Acoustic decorative finish for the control of noise reverberation from Oscar Acoustics. 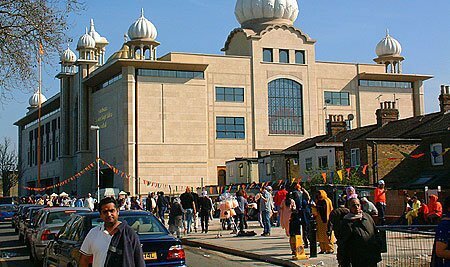 The opening of the Gurdwara, Sikh Temple, was the culmination of many years of dedicated effort by the Sri Guru Singh Sabha community based in Southall, London. The architect's awareness of the visual references used in Sikh religious buildings, ranging from symbolic patterns to the specific shape of a dome, was key to the development of a design that recognises the traditional Sikh aesthetics but at the same time will be a source of inspiration to the community in the twenty first century. Above: The concrete frame building is designed to last over a hundred years and is clad in exquisite high quality limestone and granite. The domes are located over the most sacred parts of the Temple; the dome over the Book of the Scriptures being covered in gold leaf. Left: Prayer Hall - which holds up to 2500 people. This was the area in which the temples building acoustics were most in need of treatment. Internally the concrete structure is exposed to form ribbed lattice patterns springing from the column heads. In the Prayer Hall the cantilevered structure defining the octagonal shape is reflected in the pattern of the domed lantern roof. 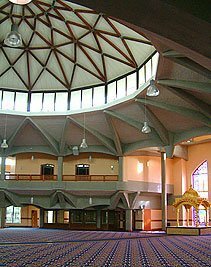 Reflected noise in the Prayer Hall was a major consideration so SonaSpray K-13 Special acoustic decorative finish was spray applied by Oscar Acoustics at 16mm thick in white between the beams to soffit areas in the 1st Floor Prayer Hall and 2nd floor Prayer Hall balconies. Without this treatment, the poor temple acoustics would have made this area unsuitable for meetings and announcements. Langer (kitchen and dining hall) where traditionally food is served without charge to all visitors of whatever creed or religion. Result, superb temple building acoustics! Temple Acoustics article by D.Mack of Oscar Acoustics.